For immediate download for only $12.95! Sharable within your school! Click Here to Download. Determined to become the first female President of the United States, Grace enters her first race in the mock election at her school. The race appears to offer some stiff competition...especially among the boys who seem intent to vote for "the best man" in the race. Another hurdle is understanding the electoral college, but her teacher handles that in a clever way that not only helps the students understand it, but also the readers! The electoral college simulation is unforgettable! Grace for President is the perfect book for preparing your students of all ages for a presidential election. The educator Bruno was famous for saying, "You can teach anything to anyone if you make it simple enough." This book fits that bill and adds fun to boot! 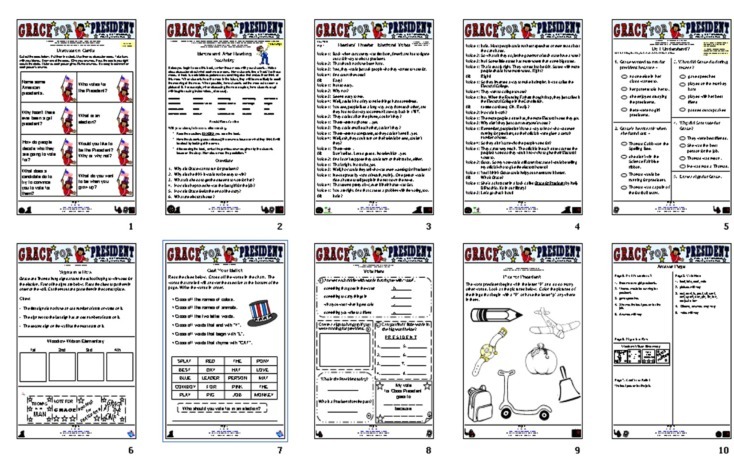 The Kids Wings activity guide for Grace for President provides fun and learning, perfect for lesson planning and printed handouts or for projection on your SmartBoard! Grace for President is included in the Kids Wings Discover Magic collection of literature guides for 58 award-winning primary-level picture books. This collection comes in a spiral-bound book with CD and site license for one school. 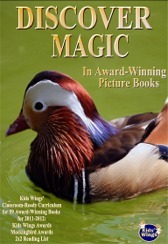 Discover Magic is a Kids Wings literature collection for 58 award-winning picture books that includes fiction and nonfiction, fantasy, reality, and more! You can purchase individual titles and title cluster for about $12.95 or you can purchase Discover Magic and receive fabulous guides and activities for 58 great picture books for less than $.75 each! This is one of the best bargain in the USA, while quantities last!